Maxar sold SSL "Building 1" for $70 million and will relocate 400 engineers to another facility. Credit: SSL video still. Last updated Dec. 17 at 10:25 a.m. Eastern. 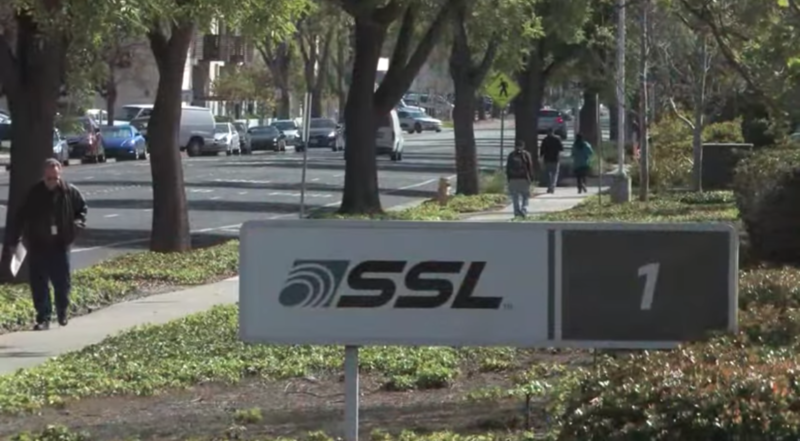 WASHINGTON — Maxar Technologies sold one of satellite manufacturer Space Systems Loral’s facilities in Silicon Valley for $70 million, the company announced today. The sale included 4.5 acres of land, about 15.5 percent of the land Maxar owns in Palo Alto, California. Maxar still has office, research and development and manufacturing facilities across another 24 acres in Palo Alto, the company said. Some 400 satellite design and production engineers will shift to a nearby facility, according to a press release. “The net proceeds from this transaction will be used to pay down Maxar debt,” Biggs Porter, Maxar’s chief financial officer, said in a statement. Maxar said relocating employees shouldn’t have an impact on production or customer work. Maxar CEO Howard Lance said Nov. 28 that the company’s divestment of its geostationary satellite manufacturing business would help the company rein in its $3 billion debt load. Company officials have valuated the total property in Palo Alto at $150 million to $200 million. Moschopoulos said the partial sale suggests a value of $386 million for the remaining land, factoring in other variables. Moschopoulos said BMO Capital Markets still expects Maxar to make an announcement before year’s end regarding how it will fully divest from building geostationary communications satellites.